Welcome to our new QUADRASTEPS® and littleSTEPS® Customers! You've made the decision to purchase QUADRASTEPS® and/or littleSTEPS®, the most effective prefabs on the market. Now you can notify (mail, email, drop off) your local referring professionals using our Referral Drop Sheet. 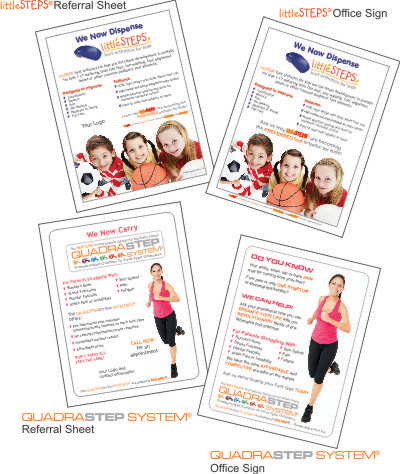 You can also post a sign in your office/facilities to make your patients aware that you can treat them and their children for a variety of foot disorders with the revolutionary QUADRASTEPS® and littleSTEPS® Prefabs! We are happy to customize any of these materials with your specific information. Let us help you make your Orthotics program a growing contributor to your success!